Episode VIII is a paradoxical, complex watch that starts with a bang, wows at every corner, and never lets up. 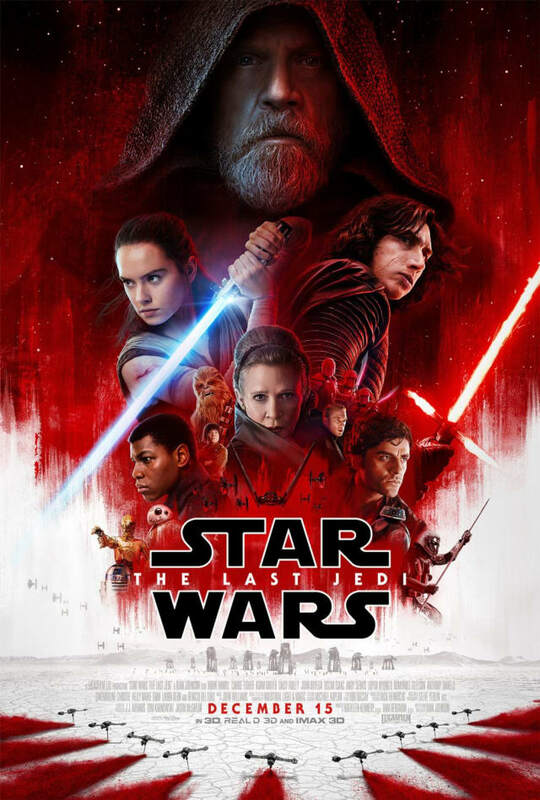 What a uniquely overwhelming, utterly bombastic journey THE LAST JEDI is. Different, yet familiar - bleak, yet hilarious - Rian Johnson has pushed the series' duality forward in genuinely shocking ways whilst seamlessly merging this generation's story with the last. Episode VIII is a paradoxical, complex watch that starts with a bang, wows at every corner, and never lets up. It's hard to put any sort of defining stamp on this entry in the series. It gives us so much. During the course of its two and a half hour runtime, TLJ delivers revelations of not only its characters' present, but their rich pasts as well. And if that wasn't enough, the film (in fitting with its duality) leaves us with just as many questions for their futures. Rey, Finn, Poe, Kylo, and of course Luke & Leia are each firing on all cylinders and we're thrown, as Maz would say, right back into the mess. In this respect, and many others, it truly is a ponderous middle-chapter that will have fans talking for years to come. Daisy Ridley opposite legacy icon Mark Hamill as Rey and "Master Skywalker", as she calls him. An enormous draw for THE LAST JEDI is Luke Skywalker himself, who's presence was avoided in THE FORCE AWAKENS to allow focus on new characters. J.J. Abrams was wise to do so, as the character is so grandiose in both his own galaxy and ours that he's quick to overshadow anything and everyone else. But here, in the long-awaited sequel, Skywalker is allowed to shine once more and it becomes immediately apparent why this particular character has such a captivating, enduring legacy: Mark Hamill. 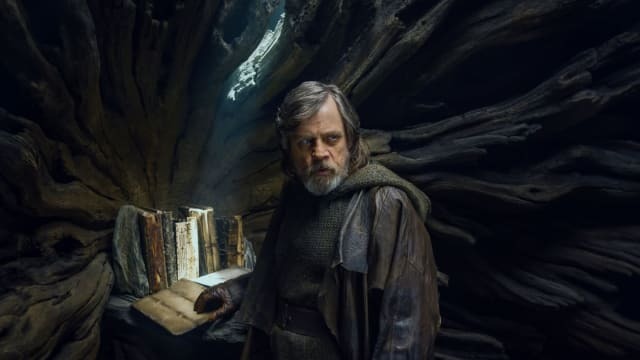 While most fans were expecting a very specific, Obi-Wan-esque Luke that had aged gracefully into a Jedi Master, Johnson & Hamill instead deliver someone much more akin to Yoda in his exile: A broken, regretful hermit. Hamill masterfully conveys what the past 35 years have done to Skywalker's soul. As a lifelong (super)fan, following and considering the timeline of events in this grander galaxy is what makes me appreciate what is done with Luke Skywalker here. So many have waited (myself included) their entire lives to see Luke grace the silver screen once more - and the visions we had in our head were of a mighty, classical hero leading a new generation of Jedi into victorious, rebuilt glory. Here's the thing, though. This happened. And we see it in THE LAST JEDI. It's just not the focus of this film or its timeline. At all. We get not one, but several glimpses into Luke's past life as the Master of a new generation of Jedi. We learn who the Knights of Ren (tragically) were, and we learn what brought not just Luke but Leia, Han, and Ben Solo to where they were in THE FORCE AWAKENS, too. We see, with our own eyes and the eyes of two key characters, what could have possibly caused so much anger, sadness, loss, guilt, and distance between this family: the Skywalker family. And with each vision into the past the vindication for Luke's absence, Leia's sorrow, and Kylo's anger grows. But that was then. THE LAST JEDI, from a storytelling perspective, is now. THE LAST JEDI is not the post-Return-of-the-Jedi tale many have waited decades for, because it came about too late. The legacy actors are much older now, and we've missed the time in their character's lives that fans were pining for. Instead, we are treated to a mature and thoughtful film that, while flawed, is a true epoch of loss, acceptance, and moving on. And Luke embodies all of this. He's a hurt, sorrowful man that has shut himself off from the Force, choosing to live as his own Jedi Master did once upon a time: alone in his failure. Luke and Yoda both lived to witness the height of what they had to offer the Jedi order, only to suffer the consequences of their hubris. Fans were able to see Yoda's pinnacle in the Prequel Trilogy, but perhaps Luke's own glory-days being relegated to flashbacks is a large part of what has some fans reeling for "something else" than what the Sequel Trilogy has to offer. Then again, "fans" don't like the Prequel films, either, so as always: to each their own. The late Carrie Fisher as General Leia Organa. Another massive draw for TLJ is the irreplaceable Carrie Fisher in her final performance. It is both heartbreaking and joyful to watch, as Leia is the soul of this film. She serves as the galaxy's last beacon of hope, the true shepherd of this next generation of characters as her twin brother lies dormant. Leia gets her due, as her role is much more substantial and vastly improved from the previous entry; we're allowed to witness our Princess pass on her legacy to Rey, Poe, and Finn, but not before finally displaying the true magnitude of her own mastery of the force. Leia's survival in this film is of her own making, and she is responsible for one of several mind-blowingly beautiful moments that's up there with the best of the franchise. The film is dedicated to her memory, and her performance is left intact right up to her presence in the film's final scene. If it doesn't hit you before then, seeing Leia so full of hope at the end of everything she's known - only to know Fisher won't be around for Episode IX - will get you. It is a true tragedy that such a uniquely gifted, outspoken advocate & talent left us at all, let alone before being able to finish Leia's story. How J.J. Abrams and Kathleen Kennedy will handle this for the sequel is beyond comprehension. It is an unenviable task. Adam Driver and Daisy Ridley carry the next generation forward as Kylo Ren and Rey. Thankfully, for any flaws there are to find in THE FORCE AWAKENS, it succeeded with flying space-colors in giving us a new cast of characters worthy of inheriting this galaxy from the likes of Han, Luke, and Leia. As much as the presence of the legacy trinity is felt in this film, it is the fresh faces that carry the weight, especially one Kylo Ren. If you were hoping for a lot more of the son of Han Solo, you're going to be surprised, shocked, and in awe. Adam Driver is such a unique force of talent and his presence electrifies this film. We see so much more of Ben Solo, his lightness, and tenfold the rage that is Kylo Ren. Many were caught off guard by the youth of Ren in his introduction, but this contributes to his psychology in such a powerful way that he surfaces after THE LAST JEDI as one of the most complex, compelling antagonists in any blockbuster of the past decade. If TLJ accomplishes one thing, it is the visceral promise that Kylo Ren is not going anywhere anytime soon, and he is going to be so much more than you ever imagined. 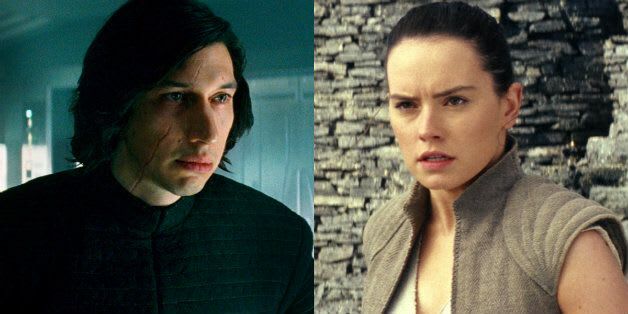 To complicate things even further for the heir of the Skywalker family, Ren's relationship with Rey is manipulatively stoked by the powers of Supreme Leader Snoke. Viewers expecting much more from Snoke and other villains like Captain Phasma will be disappointed by their limited screentime, but make no mistake: Snoke's presence is all over this film and he serves an immense purpose. TLJ's merging of Rey and Kylo Ren makes for palpable conflict, one that blurs the lines of light & dark all the way to the end until we're given a climax that feels all the more devastating/heroic for hero and villain once they've finally chosen their sides. If there is a weak link here, surprisingly it comes in the form of Rey's journey, or an absence thereof. She isn't quite shoehorned in, but suffers from audience over-familiarity with a role we've seen before verbatim in Luke's youth, and is greatly overshadowed by Mark Hamill's undeniably strong presence. 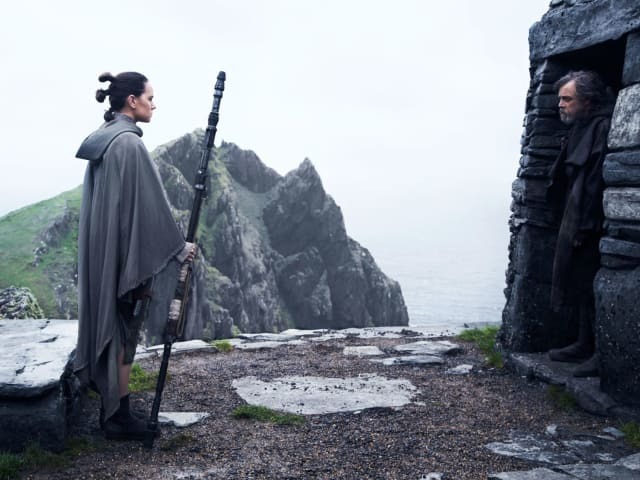 Rey seems strangely distant from the majority of the action for the second act, as her own arc of discovery ends up feeling like a way to further the plot for other characters instead of herself. Some of the magic of Daisy Ridley's perfect FORCE AWAKENS introduction of Rey is lost through this, but thankfully she finally takes matters into her own hands as we'd expect from the scrappy scavenger. Once this happens we're treated to a paradoxical deepening of the Rey/Ren dynamic that shifts the course of the franchise forever in an act so grand that you'll spend the rest of the film attempting to recover. But there's no time for that, as the hits just keep on coming. Rey's story is the poetic rhyming fans will find when mirroring THE LAST JEDI with EMPIRE STRIKES BACK. Everything else is a free-for-all. In many ways, our heroine's absence from a decent chunk of the film resembles Luke's own absence from much of EMPIRE, helping sell the fact that this is not just her movie. As EMPIRE was a tale of war and loss for Han and Leia, so is LAST JEDI, in turn, for Finn and Poe. 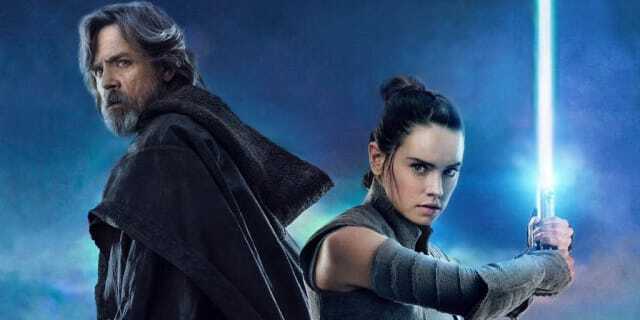 We're treated to a healthy amount of Jedi training with Rey and Luke (just as we were with Luke and Yoda) but it's not what carries the story forward. This is unexpected, given Disney's unparalleled marketing focused solely on the two pictured above. A self-exiled mentor and his new apprentice is where the similarities end, and not a single fan theory has correctly guessed at what transpires after. It's that genuinely shocking. 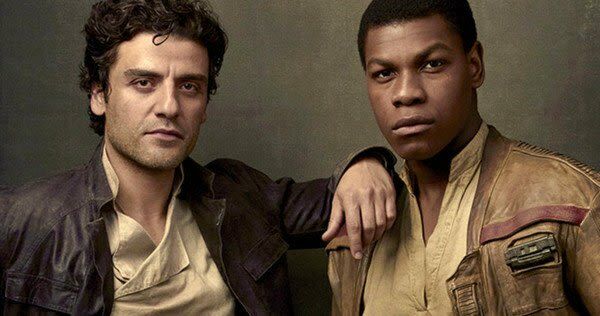 The dashing duo of Oscar Issac and John Boyega as Poe and Finn, respectively. Thankfully, though, Johnson has fully fleshed-out both Finn and Poe. Each hero is given an honest beginning, middle, and end that rings true in ways THE FORCE AWAKENS didn't have time to allow for. The franchise will be much stronger for it moving forward, too, as we've got to rely on more than just Rey and Kylo for future adventures. Rian Johnson is much more comfortable with these two rebels, and it shows. Boyega comes into his own here as a hero and action star, and crafts a Finn that is far more likable than the sometimes-jarring, jittery young defector of the previous entry. Oscar Issac shows, too, why he was a genius casting choice for this franchise as he naturally oozes that special Star-Wars-brand of charisma that few others can. His Poe is everything you want him to be: Dangerous, dashing, and reckless, while Finn is simply trying to find his place in the galaxy. He does so with the help of newcomer Rose Tico, a Resistance mechanic/nobody played by Kelly Marie Tran. She is a welcomed addition to the ensemble, but doesn't stand out in the way many were pining for. Rose brims with hope either way, a quality Finn utterly lacks until she brings it out of him. The young tinkerer serves more of a narrative plot-point purpose in this way rather than surfacing as a new icon, which is a shame, as this unfortunately leads to the anticipated Canto Bight casino storyline being largely forgettable. It's visually stunning to behold, but easily could've been left on the cutting room floor to help alleviate the film's hefty plot. Veteran actors Benicio Del Toro and Laura Dern join the STAR WARS universe with newcomer Kelly Marie Tran. 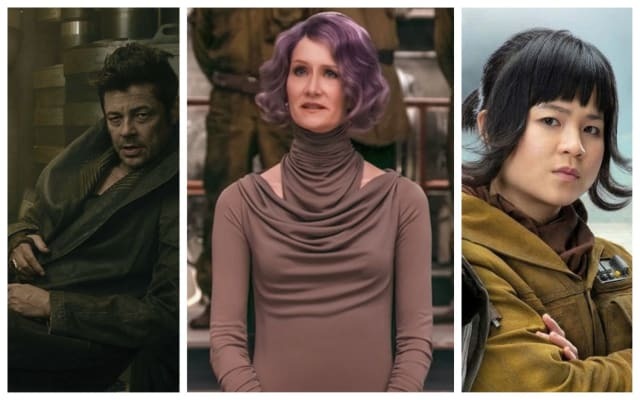 Of the other newcomers to the galaxy, Laura Dern's Vice Admiral Holdo is the strongest addition, while Benicio Del Toro's mysterious D.J. flounders. Dern's presence is always a big plus for blockbuster fans, and here she delivers a much more maternal performance than audience's may be accustomed to. Her Vice Admiral Holdo is an old ally and protege of Leia's that shares her protectiveness of the Resistance, leading to an interesting butting-of-heads with Poe's would-be advancement within their ranks. Spoilers aside, prepare for another beautifully executed plot-twist courtesy of Holdo - one that left my jaw on the floor. The exact opposite can be said of Del Toro's "D.J". He isn't terrible, but he's a character that isn't even worth spoiling, if we're being honest, and Del Toro feels either miscast or wasted in the role; perhaps both. Watching his performance is akin to someone trying to mimic what they think a 'classic' Star Wars character should feel like, and in this he misses the mark. No LAST JEDI review would be complete, however, without direct mention of the universe-altering Porgs. These weirdly adorable little critters are peppered throughout the film to great effect, and fans of the franchise will be thrilled to see them in context as they take nothing away from the larger story at hand (hence why they haven't been mentioned here prior). So there you have it, Star Wars fans, rest easy. From one ultra-SW-nerd to all others: the Porgs are alright. The Porgs are alright. Chewie swats away an unwanted Porg multiple times, and just as with the looping gif above, it never gets old. Aside from the visceral action and characters, there is so much more to experience within THE LAST JEDI. John Williams delivers another pantheon of classic scoring, but the film warrants multiple viewings just to be able to process the storytelling, let alone its musical composition, cinematography, and beyond. To put it plainly, the film looks, sounds, and feels brilliant. If it has one flaw, tough: it is a bit overstuffed, but 95% of the stuffing feels fresh and exciting - and it's hard to ask for anything more than that. All in all, Rian Johnson's entrance into the galaxy far, far away feels very appropriate for 2017. The lines between good and bad, right and wrong, seem to be stretched to their limit in our own reality, and it is interesting to watch beloved characters face the same - just with a few more explosions. It is deeply reassuring, though, to know who your friends are at the end of this intense journey. The temptation is there, to leave everything in the grey. But do this, Johnson does not. And with that, a huge spark of hope is returned to the galaxy. STAR WARS: THE LAST JEDI hits theaters everywhere Friday, December 15th.